What better time than at the beginning of a new year to take a critical look back at where we’ve come from, to reflect on our current state and to look forward to a next step in the evolution of sourcing? It believe it would certainly be helpful and beneficial to have a universally agreed upon definition of exactly what sourcing is. If you’ve attended any sourcing and/or recruiting conferences, it doesn’t take long to notice people using “sourcing” to describe different types of activities. When anyone talks about the sourcing function at their company, it immediately begs the question of exactly what the sourcers are tasked with. Do they find people and pass them on to recruiters to contact, or do they also engage the people they find? The same goes for hiring sourcers – one of the first questions is always whether or not they will be responsible for engaging potential candidates. Am I the only person who thinks this is a bit absurd, if not just unhelpful and annoying? Historically, sourcing was typically used to refer to talent identification only – name generation, org charting, finding resumes and social profiles, etc. However, I have noticed over the past few years that more people and companies are starting to use sourcing to describe both the identification and the engagement of talent, which aligns with what I’ve always believed sourcing to be. Let’s take a look at other people’s opinions on what sourcing is and leverage what sourcing is considered to involve when it comes to procurement to see if we can achieve some parity before I share with you my proposed definition of sourcing. 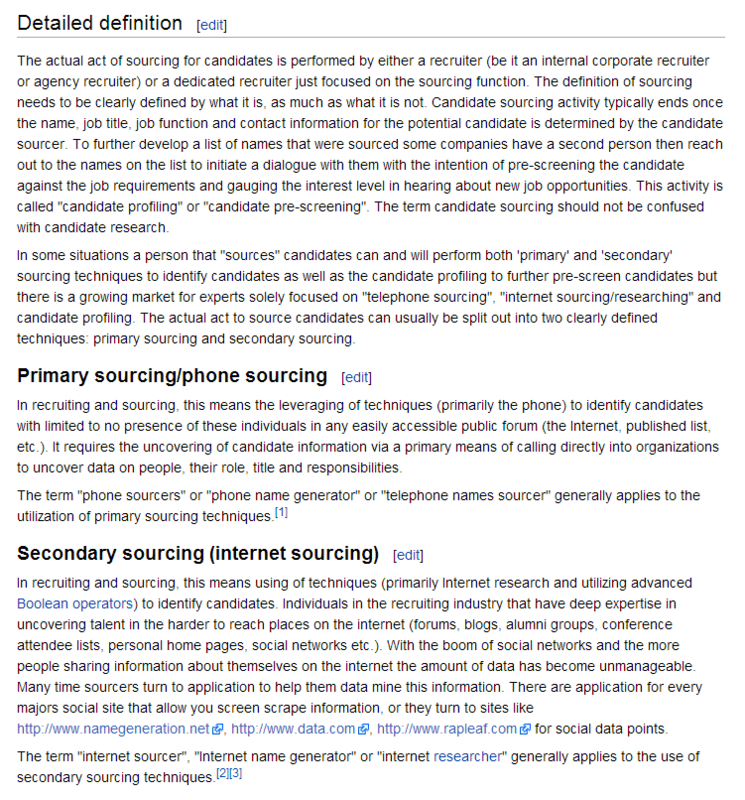 What Does Wikipedia Say About Sourcing in Recruitment? However, while I am happy to see that I’m not alone in that “the definition of sourcing needs to be clearly defined what it is, as much as what it is not,” the detailed definition claims that “sourcing activity typically ends once the name, job title, job function and contact information for the potential candidate is determined by the candidate sourcer” – which directly conflicts with the opening statement that sourcing does involve the engagement of candidates. Also, I’ve also never been a fan of separating sourcing into primary (phone) and secondary (Internet) sourcing. What Do You Think the Job of a Sourcer Is? You’ll be able to see quite a bit if disagreement as to what exactly sourcing is and what a sourcer does and does not do. What About the Definition of Sourcing in Procurement? Now let’s take a look outside of recruitment to another function that happens to use the term “sourcing” – procurement – and see if we can gain insight. 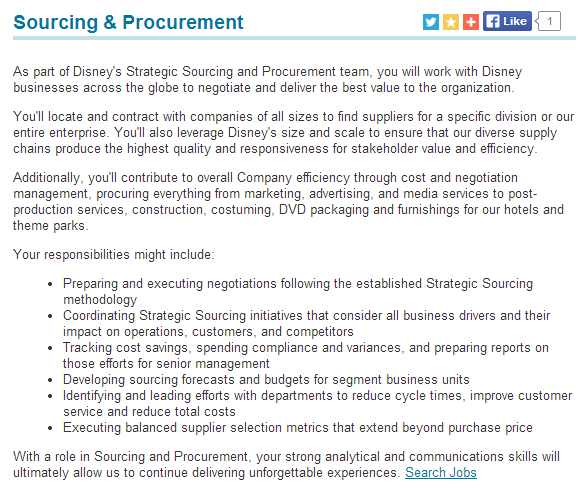 As you can see, with regard to procurement, sourcing involves “finding, evaluating and engaging…” – not just finding. (Sourcing is) responsible for locating and qualifying suppliers; driving product validations. Sourcing is a strategic methodology that matches the company’s needs with the dynamics of the market. Procurement can be a general term encompassing all aspects of the acquisition process. Procurement is point in time….Sourcing to me is a continual process of gathering and aggregating needs, researching the market place to look for opportunities and making the buy. Sourcing only begins there though as the experience from buy one drives the T&C of future buys. It really is more of the ideal feedback loop. Constant or cyclic review of needs and specifications internally and review of the external factors driving the market. By the way, what is recruitment/talent acquisition if not the procurement of talent/human resources/human capital? The proactive identification, engagement and assessment of talent focusing solely on non-applicants (typically passive talent) with the end goal of producing qualified, interested and available candidates. Additionally, sourcing can and should involve any/all means of proactively finding and identifying people (e.g., Internet research, referrals/networking, searching resume databases, mining social networks, etc.) and engaging people (phone, email, social messaging, text messaging, etc.). Furthermore, I propose that finding people – talent discovery/identification – is a part of sourcing, but if no engagement efforts are involved, the act of name/resume/profile generation should not be labeled as “sourcing,” but more accurately be referred to as research. This is the same with strategic sourcing in procurement in which “sourcing” does not end with identifying names and contact information of potential suppliers. 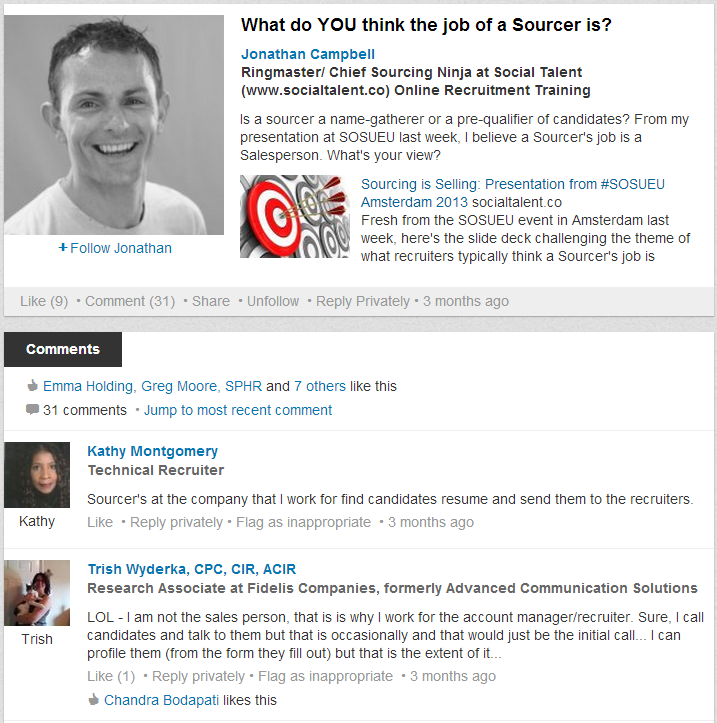 So How is Sourcing Different from Recruiting? First, I think it’s important to separate and differentiate role from function when it comes to sourcing. As for the sourcing function – sourcing is a part of the recruitment/talent acquisition process just as sourcing it is a part of procurement (of anything). Within organizations that do not have separate roles for sourcing and recruiting, recruiters perform sourcing when they proactively find, engage and qualify people who have not applied to the positions they are recruiting for. If a recruiter solely engages applicants, I would argue that while they are recruiting people, they are not performing sourcing because they are not proactively finding people. In organizations that separate sourcing from recruiting, sourcers are specialized recruiters. A great way to differentiate the roles is to have the sourcers focus on proactively finding and engaging people who have not and likely would not apply to a company’s open positions (outbound talent acquisition efforts) and have the recruiters primarily work with applicants (inbound talent). A recruiter working with applicants is akin to a retail sales associate who helps people once they’ve already come into their store and have expressed interest looking at specific products and in making a purchase. A sourcer working with non-applicants is akin to a retail associate who can get random passers-by from outside of the store who are not shopping to come into their store and make a purchase. Both roles and activities involve recruiting/selling, but their prospects are quite different and require different tactics and strategies. I think it’s actually well past time that we have a universally agreed upon definition of exactly what sourcing is, and I think it is helpful to leverage procurement’s definition of sourcing given that recruitment/talent acquisition is essentially the procurement of talent/human resources/human capital (whatever you want to call it). As such, I propose that sourcing be defined as the proactive identification, engagement and assessment of talent focusing solely on non-applicants. Additionally, sourcing can involve any means of finding and identifying people (e.g., Internet research, referrals/networking, searching resume databases, mining social networks, etc.) and engaging people (phone, email, social messaging, text messaging, etc.). Recruiters perform sourcing any time they proactively find, engage and assess non-applicants. Sourcers are specialized recruiters; they are most certainly not “junior” recruiters or people who can “move up” into recruiting roles – in fact, they can do things that “regular” recruiters (those who are not interested or adept in sourcing) can’t do, including but not limited to advanced online and phone-based research and cutting-edge candidate messaging, engagement and sales techniques and strategies that can turn people who weren’t looking to make a change from their current employer into viable candidates. I’d like you to please keep in mind that this isn’t about MY definition of sourcing – I am not looking for credit or to attach my name to anything. I am simply trying to help in the effort to arrive at a universally understood and agreed upon definition of sourcing that makes sense and aligns with procurement’s definition of sourcing. Now, if you’re curious to know where I think the hand off should occur between sourcers and recruiters in organizations where the roles are separated, stay tuned, as that’s going to be the topic of a future post. In the meantime, please let me know your thoughts.